There are other long time key players involved in this drive for one world government. Their arguments have varied but for the last 35 years environment, and now the Global Warming Hysteria, had been the main driving force behind it. You will find that some of the key figures keep popping up in all of these organisations. In a complex web these organisations intermingle and cross support each other. Even if they are formally separate with slightly different agendas. So in this post I will point to the Club of Rome and of Maurice Strong. Both key players in the planning and execution of these ideas. Maurice Strong has demonstrated an uncanny ability to manipulate people, institutions, governments, and events to achieve the outcome he desires. Through his published writings and public presentations he has declared his desire to empower the U.N. as the global authority to manage a new era of global governance. He has positioned his NGO triumvirite, the IUCN, WWF, and the WRI, to varnish U.N. activity with the perception of ”civil society” respectability. And now he has been appointed Senior Advisor to the U.N. Secretary General and assigned the responsibility of reforming the United Nations bureaucracy. The fox has been given the assignment, and all the tools necessary, to repair the henhouse to his liking. And he is an ”intresting” figure to say the4 least. Strong did business deals with arms dealer Adnan Khashoggi, and wound up with a 200,000-acre ranch in Colorado – which his wife, Hanne, runs as a New Age spiritual colony called the Baca. In 2005, during investigations into the U.N.’s Oil-for-Food Programme, evidence procured by federal investigators and the U.N.-authorized inquiry of Paul Volcker showed that in 1997, while working for Annan, Strong had endorsed a check for $988,885, made out to ”Mr. M. Strong,” issued by a Jordanian bank. It was reported that the check was hand-delivered to Mr. Strong by a South Korean businessman, Tongsun Park, who in 2006 was convicted in New York federal court of conspiring to bribe U.N. officials to rig Oil-for-Food in favor of Saddam Hussein. During the inquiry, Strong stepped down from his U.N. post, stating that he would ”sideline himself until the cloud was removed”. Strong now lives in Beijing. Strong was the UN’s envoy to North Korea until July 2005. According to Associated Press his contract was not renewed ”amid questions about his connection to a suspect in the UN oil-for-food scandal”, Tongsun Park, as well as due to criticism that he gave his stepdaughter a job at the UN contrary to UN staff regulations against hiring immediate family. “In 1978, a mystic informed Hanne and Maurice Strong that ”the Baca would become the center for a new planetary order which would evolve from the economic collapse and environmental catastrophes that would sweep the globe in the years to come.” The Strongs say they see the Baca, which they call ‘The Valley Of the Refuge Of World Truths ,'” as the paradigm for the entire planet and say that the fate of the earth is at stake. Shirley MacLaine agrees – her astrologer told her to move to the Baca, and she did. She is building a New Age study center at the Baca where people can take short week-long courses on the occult! He told Maclean’s magazine in 1976 that he was ”a socialist in ideology, a capitalist in methodology.” He warns that if we don’t heed his environmentalist warnings, the Earth will collapse into chaos. “Each year the World Economic Forum convenes in Davos, Switzerland. Over a thousand CEOs, prime ministers, finance ministers, and leading academics gather in February to attend meetings and set the economic agendas for the year ahead. What if a small group of these word leaders were to conclude that the principle risk to the earth comes from the actions of the rich countries? And if the world is to survive, those rich countries would have to sign an agreement reducing their impact on the environment. Will they do it? Will the rich countries agree to reduce their impact on the environment? Will they agree to save the earth?The group’s conclusion is ”no.” The rich countries won’t do it. They won’t change. So, in order to save the planet, the group decides: isn’t the only hope for the planet that the industrialized civilizations collapse? Isn’t it our responsibility to bring that about? This group of world leaders form a secret society to bring about a world collapse. It’s February. They’re all at Davos. These aren’t terrorists – they’re world leaders. They have positioned themselves in the world’s commodity and stock markets. They’ve engineered, using their access to stock exchanges, and computers, and gold supplies, a panic. Then they prevent the markets from closing. They jam the gears. They have mercenaries who hold the rest of the world leaders at Davros as hostage. The markets can’t close. The rich countries…? “Journalist Elaine Dewar, who interviewed Strong, described why he loved the UN. ”He could raise his own money from whomever he liked, appoint anyone he wanted, control the agenda,” wrote Dewar. Strong prefers power extracted from democracies, and kept from unenlightened voters. Most power-crazed men would stop at calling for a one world Earth Charter to replace the U.S. Constitution, or the UN Charter. How Strong since 2005 (after the UN scandal), moved to Beijing and became an agent for the Chinese government. And helps them to sell and trade carbon credits. Making another fortune for himself. Maurice Strong’s unprecedented rise to power. From the CBC documentary ‘Life and Times’ (2004). The documentary presents Strong in an very favorable and glowing light .But it give some interesting insights. Such as the influence of his socialist principal. And how he was vetted by globalist kingpin David Rockefeller in the mid-40s, at the United Nations headquarters in New York City, after Strong landed a job there with the help of people who had connections to the UN. The political stream was the pursuit of Maurice Strong and all those descendants of the Club of Rome including President Obama who want one world government with total control over everybody. That goal has not changed. The 1974 report of the Club of Rome titled, Mankind at the Turning Point says, “It would seem that humans need a common motivation…either a real one or else one invented for the purpose…In searching for a new enemy to unite us, we came up with the idea that pollution, the threat of global warming, water shortages, famine and the like would fit the bill. All these dangers are caused by human intervention, and it is only through changed attitudes and behavior that they can be overcome. The real enemy then, is humanity itself.” (my emphasis). H. L. Mencken’s comment that, “The urge to save humanity is almost always a false front for the urge to rule” is validated. The New EU foreign minister and the new European President are both undemocratic appointments to undemocratic posts created by an undemocratic treaty. That these people are so lackluster and bland apparatichs is not a coincidence according to this article. And there are merits to their arguments. Another factor is the usual squabble among the top EU nations to get THEIR candidates to the most important posts. And here nations like Sweden CAN ONLY WATCH AND HAVE TO ACCEPT WHATEVER ARE THE OUTCOME. “In fact, the anointing of Mr van Rompuy and Baroness Ashton is completely in accord with the new arrangements that brought about their promotion. The Lisbon Treaty – née the European Constitution – is not about politics. Its chief purpose is to do with management and it has thus created additional layers in an attempt to impose “consensus” more firmly on the still distressingly nationalistic member states. In that respect, the new executive directors seem ideal. Both have risen without trace through the pathways of management – we are tempted to recall the Peter Principle relating to advancement and competence. Both have reputations that resonate only among their own managerial classes and both lard their public utterances with the buzzwords of managementspeak. Post-Lisbon Europe could hardly be better served. While commercial management can sometimes be imaginative and innovative and benefit from big personalities, those are not qualities required in bureaucracies. Their survival depends upon a certain drab uniformity (see “consensus” above) enforced by Kafkaesque regulation unintelligible to those outside the circle. Consequently, Mr van Rompuy will direct an army of civil servants whose job will be to bamboozle the leaders of the member states into what can be presented to their voters as the desirable “European” approach. For such responsibilities, a distinct lack of charisma is beneficial. Already there have been mutterings among governments that their foreign affairs ministries are being downgraded and concern at a suggestion that their ministers should become EU envoys instead. How long before similar diminution overtakes national justice departments, social security ministries and treasuries? In order to complete this process, Brussels has calculated that for the moment it needs an invisible managerial hand, rather than a political Colossus, so as to confuse potential opposition. Here is the account from Vladimir Bukovksy describing an amazing meeting between President Gorbachev and representatives of the Trilateral Commission, which included David Rockefeller and Henry Kissinger. ”In the middle of it Giscard d’Estaing suddenly takes the floor and says: “Mr President, I cannot tell you exactly when it will happen – probably within 15 years – but Europe is going to be a federal state and you have to prepare yourself for that. You have to work out with us, and the European leaders, how you would react to that, how would you allow the other Easteuropean countries to interact with it or how to become a part of it, you have to be prepared,” added the whistleblower. ”This was January 1989, at a time when the  Maastricht treaty had not even been drafted. How the hell did Giscard d’Estaing know what was going to happen in 15 years time? And surprise, surprise, how did he become the author of the European constitution [in 2002-03]? A very good question. It does smell of conspiracy, doesn’t it?” said Bukovksy. “Paul Belien: You were a very famous Soviet dissident and now you are drawing a parallel between the European Union and the Soviet Union. Can you explain this? Mr Bukovsky called the EU a “monster” that must be destroyed, the sooner the better, before it develops into a fullfledged totalitarian state. “It is no accident that the European Parliament, for example, reminds me of the Supreme Soviet. It looks like the Supreme Soviet because it was designed like it. Similary, when you look at the European Commission it looks like the Politburo. I mean it does so exactly, except for the fact that the Commission now has 25 members and the Politburo usually had 13 or 15 members. Apart from that they are exactly the same, unaccountable to anyone, not directly elected by anyone at all. When you look into all this bizarre activity of the European Union with its 80,000 pages of regulations it looks like Gosplan. We used to have an organisation which was planning everything in the economy, to the last nut and bolt, five years in advance. Exactly the same thing is happening in the EU. When you look at the type of EU corruption, it is exactly the Soviet type of corruption, going from top to bottom rather than going from bottom to top. Giuliano Amato, former Italian Prime Minister and the other former Vice President of the Convention which wrote the EU Constitution. ”The good thing about not calling it a Constitution is that no one can ask for a referendum on it.” – 21 February 2007. ”The most striking change (between the EU Constitution in its older and newer version ) is perhaps that in order to enable some governments to reassure their electorates that the changes will have no constitutional implications, the idea of a new and simpler treaty containing all the provisions governing the Union has now been dropped in favour of a huge series of individual amendments to two existing treaties. Virtual incomprehensibility has thus replaced simplicity as the key approach to EU reform. As for the changes now proposed to be made to the constitutional treaty, most are presentational changes that have no practical effect. They have simply been designed to enable certain heads of government to sell to their people the idea of ratification by parliamentary action rather than by referendum.” – Irish Times, 30 June 2007. “We have renounced everything that makes people think of a state.” Gone are the words, constitution, flag, anthem and motto. And all this striving for Grandeur and Pomp by the leaders of EU, they Demand Obedience and Attention as if they think they where ancient emperors. Not, as they are supposed to be, servants of the people of Europe. All paid by the taxes from the common people. THE new European President Herman Van Rompuy was slammed yesterday for “acting like a king” after trying to host his first EU summit in a palace. 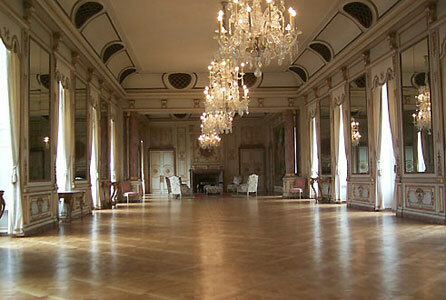 Mr Van Rompuy originally wanted to hold the gathering in the 18th Century Palais d’Egmont in Brussels. But after pressure from Europe’s capitals, he switched the Brussels meeting to another prestigious, but less regal, building hundreds of yards away from the usual office block venue where EU leaders meet. Diplomats are still predicting “chaos” when EU leaders get together next week in the Bibliotheque Solvay, a cramped 100-year-old library that does not even include interpreter booths. 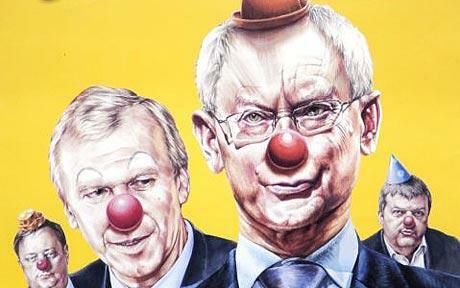 Far from being a king, Mr Van Rompuy, 62, has been dismissed by his sister Christine, a member of a rival political party, as a clown. She helped produce a mocking poster last year of her brother sporting a red nose and clown’s hat in an election. Next week’s talks will focus on proposals from Mr Van Rompuy to give the EU more “economic governance” powers in the aftermath of the recession and after implementation of the Lisbon Treaty, which came into force last month. Diplomats are concerned Mr Van Rompuy might be trying to push EU leaders into agreeing economic proposals without support from national delegations – housed in a different building without communication links. He has already insisted he alone will draw up a paper proposing economic targets and policy for the year 2020 to be set at the EU level. As a complement to my previous post about EU, EEAS and Haiti here is some more on EEAS or the EU foreign service and the new foreign minister. “And the background of the new EU foreign minister (the High Representative for Foreign Affairs). Here main qualification seems to have been here lack of diplomatic experience. And that she is a Labour Baroness (she worked with business to abolish inequality), and has never held an elected office before. As the Gerald Warner so aptly point out: “this serial appointee is custom-made for high EU office”. Well it seems that the commission acted very quickly. As expected. And which they have prepared for even if they where not officially allowed to do that before the Lisbon Treaty went into force. The commission also made a power grab, as expected, to even further strengthen it’s power over foreign policy. And of course “lady” Ashton was no match for them. Well, she has lived up to all these “expectations”. Ant the British are VERY Worried that EEAS is going to take over. Especially since the Britain’s Foreign Office is in financial and budget crisis and is scaling back representation abroad. But the Swedish Foreign Office is NOT worried or concerned. We apparently have MUCH MORE INFLUENCE AND RESOURCES THAN THE BRITISH. And the Germans are also worried. But don’t worry, be happy! “Mats Persson, director of the Open Europe think tank, said the new EU embassies would, for ”all practical purposes”, take over the job of representing Britons on the world stage. “Geoffrey Van Orden, a Conservative MEP on the parliament’s foreign affairs committee, warned the commission was using the Lisbon Treaty and Lady Ashton’s dual role as a commissioner and foreign minister to undermine national sovereignty. ”The Eurocrats want to shift foreign policy away from the nation states to the commission. She is the instrument for this,” he said. “Many larger EU member states, including Britain and Germany, are concerned that José Manuel Barroso, the commission president, is plotting to keep national diplomats out of senior European diplomatic corps jobs. “The European Union’s High Representative for Foreign and Security Policy was in Washington yesterday to meet with Hillary Clinton at the State Department, but she was barely a blip on the Beltway radar screen. Even the underwhelming David Miliband, hardly a household name on this side of the Atlantic, managed to significantly overshadow the visit of his EU counterpart when he delivered an exceedingly dull and unimaginative statement on the forthcoming London conference on Afghanistan before the Senate Foreign Relations committee. There was virtually no US press coverage at all of Catherine Ashton’s first trip to the United States as the EU foreign policy supremo, and she hardly set Foggy Bottom alight. Almost every major American news outlet ignored her presence in Washington, which is hardly surprising given that few reporters here would have any idea who she was. More than 50 European Union embassies have opened across the world since the Lisbon Treaty came into force three weeks ago. The move has led to fears that British consular facilities could be shut down as Brussels establishes itself as a world power. Critics say the 54 new embassies in countries including Afghanistan, China, India and 33 African nations will shift power away from the British foreign office towards a new EU diplomatic service. Embassies in the key capitals of Beijing, Kabul and Addis Ababa, the seat of the African Union, are regarded as marking a major shift to giving the EU a role as a global player to rival nation states. The embassies will takeover national bilateral missions in the 54 countries where they are set up, headed by ambassadors who are empowered to speak on behalf of the EU as a whole. ”They are going to be a bit more political,” a Brussels official told the EU observer website. The decision to give 54 of the European Commission’s 136 delegations full ambassadorial status was taken without any public announcement when the Lisbon Treaty entered into force three weeks ago. Twelve of the embassies are in Asia and the Pacific Ocean, including Australia, China, India, Indonesia and Vietnam. A network of 33 in Africa will cover countries ranging across the continent from Ghana to Kenya and South Africa to Zimbabwe. Eight of the new-model units are in Europe in Armenia, Georgia, Macedonia, Moldova, Norway, Serbia, Switzerland and Ukraine. A decisions over New York has been delayed amid a fierce political battle over the EU’s role in the United Nations Security Council. Mats Persson, director of the Open Europe think tank, said the new EU embassies would, for ”all practical purposes”, take over the job of representing Britons on the world stage. ”Common EU embassies means that Britain can be overruled on crucial diplomatic matters, such as on how to respond to human rights abuses in a conflict-ridden country,” he said. The Lisbon Treaty has created an embryonic diplomatic corps, the European External Action Service, under the control of an EU foreign minister, a post held by Baroness Ashton. A text, agreed by European leaders, including Gordon Brown, last October gives the EU ”delegations” the objective of taking over consular work, a new role that could lead to British consulates being closed in remote countries to make cash savings. ”EU delegations could gradually assume responsibility, where necessary, for tasks related to diplomatic and consular protection of Union citizens in third countries, in crisis situations,” the text states. The Conservatives have accused the government of drafting plans to close overseas embassies and consulates as part of a wider programme of spending cuts. An internal Foreign Office memorandum, leaked to the Tories, has urged diplomats to fire staff and close some overseas posts. The Foreign Office has defended the new EU embassies. Baroness Ashton’s political inexperience has allowed the European Commission to seize control of Europe’s foreign policy from national governments, MEPs and diplomats have warned. During a hearing in the European Parliament on Monday, Lady Ashton faced repeated questions over who was really in charge of Europe’s foreign affairs and security policy. The Labour life peer, who has never held elected public office or a post as a diplomat, has been instructed by national governments to set up a new diplomatic corps, the European External Action Service (EEAS), to carry out EU foreign policy independently of the commission. As High Representative, or foreign minister, a post created under the Lisbon Treaty, Lady Ashton, 53, is also supposed to preserve the control of the Council of the EU, representing national governments, over foreign policy while also being a commission vice-president. But since taking up her post on January 1, she has been criticised for failing to assert her own authority, for basing her office in the Brussels executive’s headquarters and for using commission officials as her key advisers. Geoffrey Van Orden, a Conservative MEP on the parliament’s foreign affairs committee, warned the commission was using the Lisbon Treaty and Lady Ashton’s dual role as a commissioner and foreign minister to undermine national sovereignty. Following the introduction of the Lisbon Treaty at the end of last year, a turf war has broken out between commission officials and diplomats over control of the foreign minister and EEAS. Many larger EU member states, including Britain and Germany, are concerned that José Manuel Barroso, the commission president, is plotting to keep national diplomats out of senior European diplomatic corps jobs. Mr Barroso’s decision, late last year, to remove ”neighbourhood” affairs, EU foreign policy for neighbouring countries such as Ukraine and the Balkans, from Lady Ashton’s brief as commissioner was widely seen as a power grab. Diplomats have also noted the growing influence over Lady Ashton of Joao Vale de Almeida, Commission director general for external relations, who was Mr Barroso’s closest and most senior adviser until last June. ”Ashton is not a strong figure politically and her weakness is allowing the commission to empire build – which was not the idea behind her post,” said one diplomat. During Monday’s confirmation hearing in front of the parliament’s foreign affairs committee, Lady Ashton denied that she allowing the commission to take control. ”It is not a land grab. It is collaboration,” she said. MEPs will vote on the new commission, including Lady Ashton on Jan 26. Charles Tannock, a Conservative MEP, said he was ”underwhelmed” by her performance. ”But I suspect that we will still support her,” he added. Nile Gardiner is a Washington-based foreign affairs analyst and political commentator. He appears frequently on American and British television and radio, including Fox News Channel, CNN, BBC, Sky News, and NPR. The European Union’s High Representative for Foreign and Security Policy was in Washington yesterday to meet with Hillary Clinton at the State Department, but she was barely a blip on the Beltway radar screen. Even the underwhelming David Miliband, hardly a household name on this side of the Atlantic, managed to significantly overshadow the visit of his EU counterpart when he delivered an exceedingly dull and unimaginative statement on the forthcoming London conference on Afghanistan before the Senate Foreign Relations committee. Even her remarks at a joint press conference with the Secretary of State merited barely any attention, with the major press focus upon Clinton’s views on Haiti and Iran. Ashton’s comments were lacklustre and flat, betraying a striking dearth of foreign policy experience and knowledge. She also clearly lacks the presence, gravitas and charisma to be an international statesman, and bears all the hallmarks of a spectacularly unqualified apparatchik appointed way above her station as part of a cynical backroom deal between Europe’s big players. The unaccountable mandarins of Brussels may like to see themselves as the gilded guardians of a rising superpower, but in reality the international voice of the European Union is still nowhere near as powerful as that of individual European nation states, and that is how it should stay. I was relieved therefore that the EU was not represented by a far more formidable figure with considerable weight and popularity in America, like Tony Blair. Had the former Prime Minister swanned into town as the president of the European Union, there would have been a bank of television cameras awaiting his presence, and his views would have been widely reported. Anything that undermines the Lisbon vision of the EU as a powerful supranational force is a good thing, and the appointments of both Baroness Ashton and Herman Van Rompuy will do that in spades. Better a weak non-entity as foreign minister or president than a powerhouse Henry Kissinger at the helm if the nefarious European Project is to be defeated. Baroness Ashton’s pitiful lack of impact in her first foray in America demonstrated that the EU is currently an emperor with no clothes, lacking the power to be a global political force. But, there is no room for complacency among those of us who believe in the sanctity of the nation state, and are opposed to the rise of a federal Europe. The fundamentally undemocratic Treaty of Lisbon will dramatically erode sovereignty in Europe, and over the next few years it will significantly drive a European foreign policy and defence identity. As the euobserver has just reported, the EU has already “converted 54 out of the European Commission’s 136 foreign delegations into embassy-type missions authorised to speak for the entire union” in preparation for the creation of a new EU diplomatic corps. There is a very real danger that over the next decade, Washington will increasingly do business directly with the EU, at the expense of individual European capitals. This would be a grave mistake on the part of the United States, and would result in a significant weakening, rather than strengthening, of the transatlantic alliance, as well as the further decline of the Anglo-American Special Relationship. The next British government must firmly oppose and do all in its power to fight the rise of a European foreign and defence policy, and ensure that vital matters of national interest are decided in London and not Brussels. It must also send a clear message to Washington that American support for a federal European superstate will only serve to undermine the Anglo-American alliance. Or the mouse that whined. In contrast, within hours the US took the lead in forming an alliance with Australia, India and Japan, and sent in two battle groups fully equipped to deal with such an emergency. Now in Haiti the same pattern repeats itself again. And what did EU do? It acted as usually “very forceful” and hold a press conference. Yes, a boring press conference! The people of Haiti MUST BEE VERY REASSURED AND COMFORTED BY THE THOUGHT THAT EU:s foreign minster had a press conference and sent her ”condolences” , NOT TO HAITI OR THE PEOPLE AFFECTED BUT TO the UN Secretary-General, Ban Ki-Moon. This is the same EU that pride itself of being a dominant world power. And the bureaucrats in Brussels have even bigger ambitions that that. AS WE HAVE SEEN AGAIN AND AGAIN – It’s NEITHER RAPID NOR REACTING! And to top it off EU (the usual suspects) criticised USA for ”occupying” Haiti. That’s how you gain respect and trust – You talk loud, do nothing and harshly criticise the ones that actually do anything. Compare and contrast the initial responses of two ”major world powers” to the Haitian earthquake disaster. Within hours of Port-au-Prince crumbling into ruins, the US had sent in an aircraft carrier with 19 helicopters, hospital and assault ships, the 82nd Airborne Division with 3,500 troops and hundreds of medical personnel. They put the country’s small airport back on an operational footing, and President Obama pledged an initial $100 million dollars in emergency aid. Meanwhile, across the Atlantic, the European Union geared itself up with a Brussels press conference led by Commission Vice-President Baroness Ashton, now the EU’s High Representative – our new foreign minister. A scattering of bored-looking journalists in the Commission’s lavishly appointed press room heard the former head of Hertfordshire Health Authority stumbling through a prepared statement, in which she said that she had conveyed her ”condolences” to the UN Secretary-General, Ban Ki-Moon, and pledged three million euros in aid. A gaggle of other Commision spokesmen followed, to report offers of help from individual member states, such as a few search and rescue teams, tents and water purification units. We were also told that an official EU representative would be trying to reach Haiti from the Dominican Republic, to stay for a few hours before returning to report what he had found. Memories might have gone back to December 2004, which saw similarly contrasting responses to the Indian Ocean tsunami catastrophe which cost nearly 300,000 lives. Again, within hours the US took the lead in forming an alliance with Australia, India and Japan, and had sent in two battle groups fully equipped to deal with such an emergency, including 20 ships led by two carriers with 90 helicopters. President Bush immediately pledged $35 million, later rising to $350 million. Because they were self-sufficient, the US forces pulled off a stupendously successful life-saving operation, almost entirely ignored by the British media, notably the BBC (whose journalists on the spot were nevertheless quite happy to hitch lifts from US helicopters). The EU, by contrast, pledged three million euros for the tsunami victims, called for a three-minute silence (three times longer than is customary to remember the millions who died in two world wars) and proposed a ”donors’ conference” in Jakarta nearly two weeks later to discuss what might be done. The only real difference between these two episodes is that, in the five years which have elapsed since 2004, the EU has even more noisily laid claim to its status as what Tony Blair liked to call ”a world superpower”, capable of standing on the world stage as an equal of the US. Anyone who witnessed the dismal showing at Thursday’s press conference of the High Representative, which would scarcely have passed muster at a board meeting of the Hertfordshire Health Authority, might well cringe at the thought. Baroness Ashton, the European Union’s foreign minister, has come under fire for failing to visit Haiti and letting America take command of the international aid response. Lady Ashton, who had little or no diplomatic experience when she took the High Representative of Foreign Affairs job last year, is in charge of the EU’s crisis and humanitarian aid response. France, which accused the United States of ”occupying” Haiti earlier this week, has been dismayed by the EU’s lack of ”visibility” during international relief efforts over the last 10 days. Michel Barnier, the French internal market commissioner, is said to have briefed against Lady Ashton by pointing out France’s foreign minister was ”immediately available” on the ground following the Asian Tsunami in 2004. He denied the claim and insisted ”she can count on me to work with her on strengthening Europe’s foreign and defence policy – an area of work I have always been interested in”. But French press reports have described Mr Barnier as ”seething” and ”enraged” that EU had not acted on his ideas, a failing emphasised by US control of the Haiti relief operation. Following the tsunami, Mr Barnier wrote an influential report calling for the creation of an EU civil protection force called ”Europe Aid”. Joseph Daul, a senior centre-right MEP and a close ally of Nicolas Sarkozy, expressed regret that Lady Ashton was absent when Hillary Clinton, US Secretary of State, visited Haiti at the weekend. Daniel Cohn-Bendit MEP, the former French student radical and leader of the European Greens also attacked her. ”I am very sceptical about Lady Ashton,” he said. A spokesman for Lady Ashton said she had organised an emergency meeting of EU aid ministers that raised over £350 million in pledges for Haiti. The EU should consider forming a rapid reaction force to deal with future emergencies like the Haiti earthquake. This is according to ”the EU’s new president,” retailed to us by the ever diligent BBC. ”We have to reflect about a better instrument for reaction,” says Herman Van Rompuy. After providing emergency aid to Haiti the EU should consider a ”humanitarian rapid reaction force”, he said. In fact, the EU set up a ”Rapid Reaction Mechanism” in 2001, under Council Regulation (EC) No 381/2001 – with the intention of dealing with precisely the eventualities that Rompuy is setting out, and which so lamentably failed in the 2004 Tsunami and again in Haiti. More than ten years on and we are no further forward than we were then – countless reports and study groups have been commissioned, there have been countless meetings, working groups and conferences, with millions of euros having been spent. Yet, when the chips are down, the EU is nowhere to be seen. It was ever thus, and will always be so. All the EU is ever good for, when it comes to action on its own part, is talk. But this is not ”victimless” state of affairs. Because the issue is being dealt with at a ”European level”, member states are actively discouraged from making their own plans and arrangements. Thereby, national capabilities are wound down yet, in the lethargic, inept grip of the EU institutions, nothing is done to replace those capabilities – still less to enhance the overall effort. And, when there is a crisis, because the EU claims the lead role in responding, no member state can step forward to fill the vacuum created by the EU’s painfully obvious inadequacies. 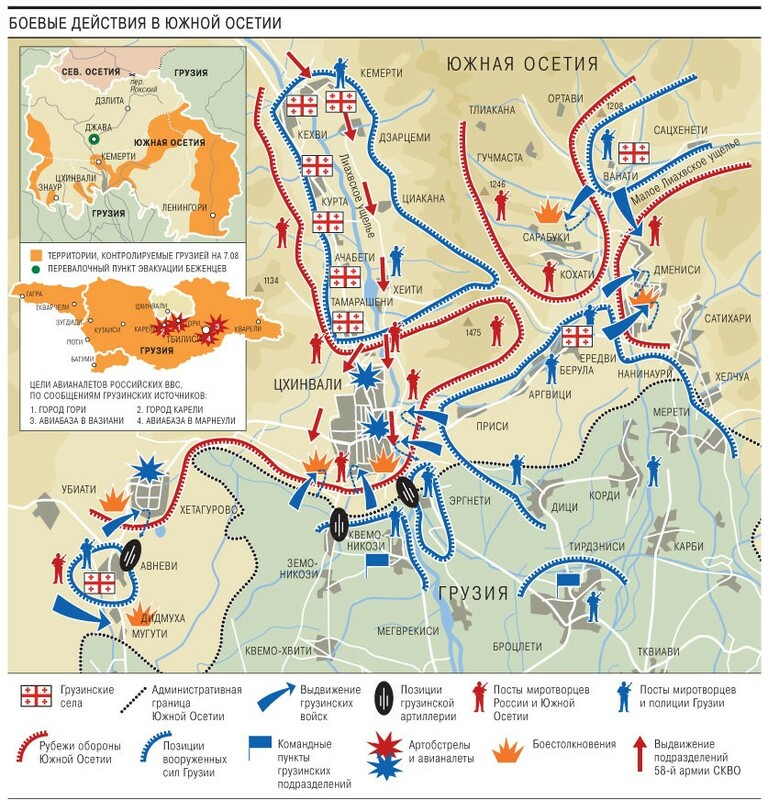 Thus, once again we get clarion calls (if anything Rompuy says could be called ”clarion”), dusting off ancient press releases to demand yet again a ”humanitarian rapid reaction force”. In ten years time, no doubt, they will be recycling the same press releases, demonstrating, once again, that using ”EU” and the word ”rapid” in the same sentence is an oxymoron. Yet, despite its ongoing inadequacies, the one thing the EU will never do is recognise its own uselessness and walk away from its grand pretensions, leaving the heavy lifting to national agencies. As in all things to do with the EU, its ambitions of glory outstrip any practical considerations. Even the lives of disaster victims are of little consequence when it comes to promoting the European agenda. As the full horror of the disaster in Haiti begins to emerge, we seem to be going through a cycle which is all too familiar – most notable from December 2004 when the tsunami struck south Asia. Then – as we were to observe many times – the world was split into two main categories: those who did something about it, and those who talked about doing something about it. In the former category fell the United States which took the lead in forming an alliance with Australia, India and Japan, and within hours had despatched two battle groups fully equipped to deal with such an emergency, including 20 ships led by two carriers with 90 helicopters. The EU, in the meantime, took nine days to launch a ”donors’ conference”, the start of grotesque bidding process which had different nations vying with each other to be seen as the most generous. In the immediate aftermath of the tsunami, president Bush pledged $35 million and then, under pressure from the media and other nations – to say nothing of the United Nations, which accused the US of being ”stingy” – increased contributions to $350 million. But, as was already becoming apparent, money was the lesser of the problems. What was really needed was immediate, practical assistance, and it was that which the US-led alliance was best able to give. We remarked at the time that the collective value of the hardware that the US alone deployed was well in excess of $2 billion, yet the provision of this form of direct aid did not figure in the cash sums offered by the US government. However, the EU sought to learn from the experience and has since attempted to enhance its capabilities. But, despite multiple initiatives to reinforce the EU’s ”emergency and crisis response capacities”, all the EU could manage this time by way of immediate response was to hold a Brussels press conference led by Commission Vice-President Baroness Ashton, now the EU’s High Representative – our new foreign minister. This lacklustre response was noted by Booker in his column yesterday, who recorded how a scattering of bored-looking journalists in the Commission’s lavishly appointed press room heard the former head of Hertfordshire Health Authority stumbling through a prepared statement, in which she said that she had conveyed her ”condolences” to the UN Secretary-General, Ban Ki-Moon, and pledged three million euros in aid. Despite the pretentions of the EU in building a rapid reaction force to deal with disasters, that was never going to come to much. But in its development aid – alongside the UN – the EU prides itself in being the world’s leading contributor and a champion of third world development, standing in the forefront of fund-raising efforts. Thus, again we see the same dynamic, with Claudia Rosett reporting that the tranzies are passing round the begging bowl, and it is left to the US, once again, to make the running. Within hours of Port-au-Prince crumbling into ruins, the US had sent in an aircraft carrier with 19 helicopters, hospital and assault ships, the 82nd Airborne Division with 3,500 troops and hundreds of medical personnel. They put the country’s small airport back on an operational footing, and President Obama pledged an initial $100 million dollars in emergency aid. Yet, despite the tranzie’s enthusiasm for collecting huge sums of money, very little seems to have been learned from the tsunami experience. A year after disaster struck – with $13 billion of aid pledged – much of it was unspent. Two years later, the situation was much the same, in what amounted to a running scandal. By 2007, there were calls to re-allocate the unspent funds. Despite all this, the most ”constructive” idea the EU has had to date is to call for an international conference. Yet Haiti has already had its fair share of such conferences, the latest being a donor conference, held in April 2009. This was organised in the aftermath of four devastating tropical storms. At the time, there were peldges of $324 million over the next two years, short of the $900 million Haiti’s prime minister said he needed, but the sum later increased to $760 million. However, by November 2009, only $21 million had actually been disbursed. Some of the problem has been that much of the UN’s efforts have been devoted to climate change – even in the context of disaster relief. And such is the obsession of the EU with the issue that its efforts on disaster relief have been similarly focused. Yet, surveying the disaster that is Haiti, few will dispute that the high casualty rate and the ensuing chaos stems from the lack of effective governance over a very long period of time. Thus, while US forces – aided by small aid contingents from other countries – are engaged in a desperate race against time to rescue trapped people and care for the immediate needs of the survivors, the real tragedy is that so little has been achieved before the event that would have better prepared Haiti for the disaster that has just struck. On both counts, therefore – in terms of immediate relief and long-term aid, the tranzie nexus of the EU-UN has failed once again. And once again it has been left to nation states such as the US to pick up the pieces. One day the world will re-learn the lesson that trans-national agencies are an evolutionary dead-end and that the core or civilisation is and will remain the nation state.